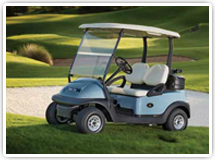 Indiana Golf Car sells new Club Car golf cars, including Precedent i2 and i2 Signature Edition 2 and 4 passenger models, Villager 4, 6 & 8 models, and Gold Standard remanufactured Precedent models. We also sell used Club Car, EZ-GO and Yamaha golf cars, and can customize golf cars with one-of-a-kind paint jobs and bodies. 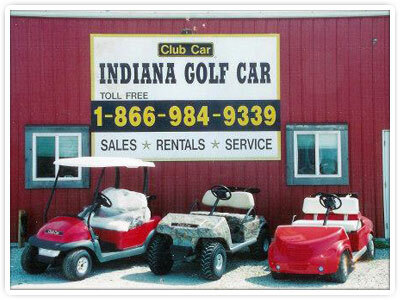 Indiana Golf Car services & repairs Club Car, EZ-GO and Yamaha golf cars. Call us today at 317-984-9339 to schedule an appointment or fill out our online service request form. 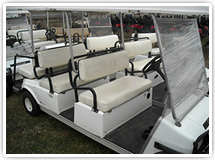 Indiana Golf Car stocks Club Car factory and after market parts. We can also obtain parts for EZ-GO and Yamaha golf cars. 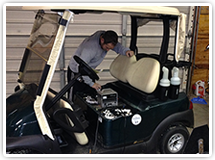 If you are looking to repair or accessorize your golf car, give us a call at 317-984-9339. If we don't have the part in stock, we will gladly order it for you. Do you have an upcoming special event or ocassion? Indiana Golf Car also rents golf cars! Whether you need 1 or 100 golf cars, we can help. Call us today at 317-984-9339 to schedule your event or fill out our online rental request form. Indiana Golf Car is owned by PGA Professional Scott Steger and his wife Donna. It was established in 1997 to provide Club Car products and service for the growing Central Indiana golf course community. 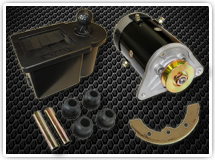 Club Car is the industry leader in both performance and reliability. We are proud to be associated with Club Car. Our business has grown over the years as we have continually provided not only our golf courses but also our individual customers with the best product and service available in Central Indiana.